NEW YORK (CNN) -- A Manhattan jury awarded $2.33 million to a man who lost his leg after drunkenly stumbling onto the path of an oncoming subway train. Dustin Dibble fell on New York subway tracks, was hit by a train and had his leg severed in 2006. Dustin Dibble, 25, landed in the subway tracks after a late night watching a hockey game at a bar with friends April 23, 2006. A downtown N train ran over him, severing his right leg. According to Dibble's lawyer, Andrew Smiley, NYC Transit rather than Dibble bore primary responsibility for the accident because the subway driver had time to stop the train but did not. Smiley added that Dibble's drunkenness did not excuse the driver, who said in a court deposition that he mistook Dibble for an inert object. "They don't get a free pass as to why the person was on the tracks. They are trained to be able to look out for people on the tracks ... and people are known to be intoxicated by night," the lawyer said. Dibble's blood-alcohol level at the time of the accident was .18, according to his lawyer, more than twice the legal limit had he been behind the wheel of a car. The jury ruled Tuesday that Dibble was 35 percent responsible for the accident, so his monetary compensation was also reduced by 35 percent -- from $3,594,943 to $2,336,713. 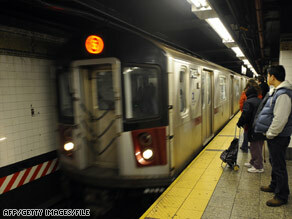 The deficit-plagued MTA plans to appeal the decision, according to spokesman James Anyansi.